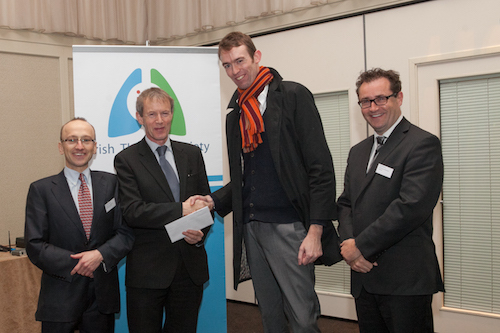 Receiving the award for Best Oral Presentation (Basic Science) at the Irish Thoracic Society Annual Scientific Meeting 2012 is Dr David O’Dwyer, St Vincent’s University Hospital. Also pictured are Dr Aidan O’Brien, Mid Western Regional Hospital Limerick, Dr Colin Edwards, Boehringer Ingelheim Ireland and Dr Edward McKone President, the Irish Thoracic Society. 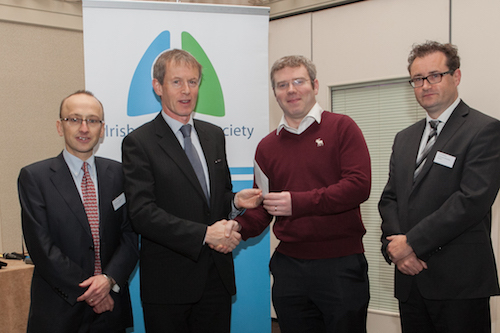 Receiving the award for Best Oral Presentation (Clinical) at the Irish Thoracic Society Annual Scientific Meeting is Dr Brian Kent, St Vincent’s University Hospital. Also pictured are Dr Aidan O’Brien, Mid Western Regional Hospital Limerick, Dr Colin Edwards, Boehringer Ingelheim Ireland and Dr Edward McKone President, the Irish Thoracic Society.